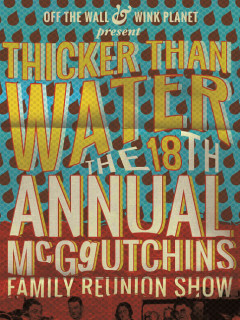 Join ColdTowne Theater every Saturday in November for Thicker Than Water: The McGgutchins' 18th Annual Family Reunion Show — a night of sketch comedy that will touch you in places that you may not want to be touched. The McGgutchins are comprised of two halves (sketch groups Off The Wall and Wink Planet) that can’t help but scuffle whenever they're near each other. If you bring canned food then you'll get a discounted ticket! $5 in advance or with canned food donation; $8 at the door.